Found poetry needs a good source to borrow from. Thus the only reason I chose Alice Sebold’s “Almost Moon” is that its page 143 was particularly intriguing. One phrase “arced and warbled” set the tone for a poem whose mystery will remain complete. Interpretation? Lots of space for that for curious readers looking far and wide between the lines. I am a professional teaching pianist and have written poetry ever since I can remember. 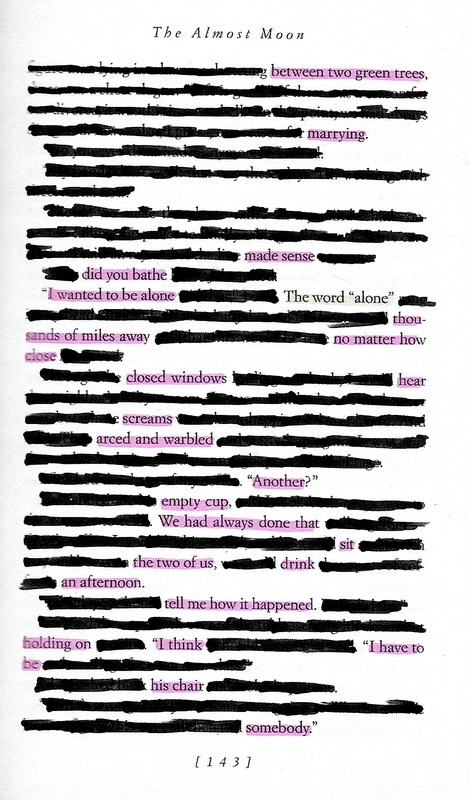 The exercise of found poetry gives me the opportunity to turn words into someone else’s life testimony. Alfred Booth, correctly capitalized is the pianist. alfred booth, the poet. My poem. You’ll find the words saved from black-out in clearer (yellow) marker form the title, obviously chosen after I selected what need to be used.